You are going to Watch One Piece Episode 440 English dubbed online free episodes with HQ / high quality. Stream Anime One Piece Episode 440 Online English dub Believe in Miracles! Bon Clay’s Cries From the Heart! 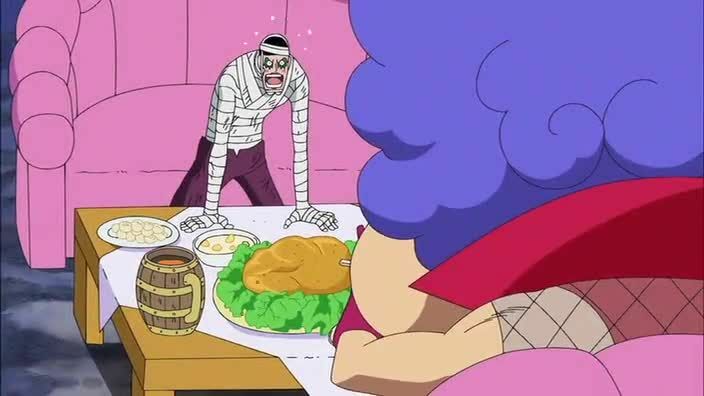 Ivankov tells Bon Clay that he has eaten the Horm-Horm Fruit, which enables him to manipulate people’s hormones for various purposes, and that New Kama Land lies between Level 5 and Level 6. He says that Level 6 truly exists and is a place where prisoners who are incredibly dangerous or harmful to the World Government’s reputation, such as former head warden Shiryu, are kept. Despite the long time for treatment, and low risk of survival, Bon Clay keeps on cheering for Luffy until his voice gives out, with the other New Kamas joining in. Meanwhile, Ace worries about Luffy always taking risks for his sake while the guards discover Luffy’s disappearance and prepare to transport Ace to his execution. Eventually, Luffy’s screams stop and he, having completed his treatment after less than a day, eats a large amount of food and declares that he has recovered.